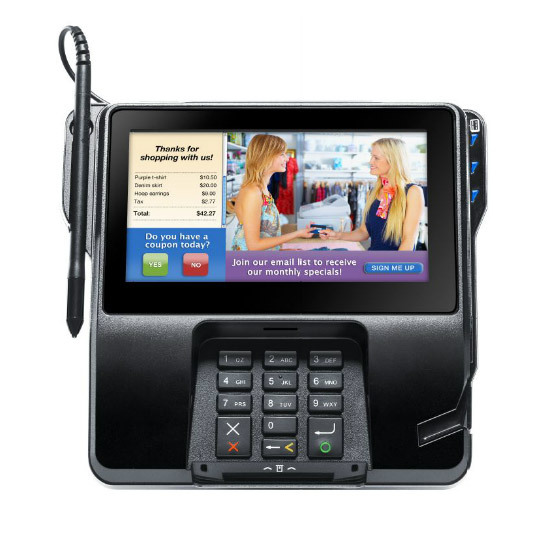 The MX 925 helps influence consumers’ buying decisions by enabling merchants to show consumers targeted video and promotional presentations at the point of sale. With clear, colorful multimedia promotions shown on a stunning 7″ color display — the largest and highest-resolution display in the industry — merchants can dazzle customers with graphics of the latest offers and products. The high-speed powerful processor and generous memory allocation supports full studio showcase promotions and video advertisements to help boost sales and levels of service. The MX 925 engages consumers with streamed media and visual promotions to encourage consumer ­­­interaction and support loyalty and promotional programs – ultimately improving consumer satisfaction and increasing revenue. The MX 925 supports multiple payment types: mag-stripe, EMV, PIN debit, NFC/contactless and non-traditional payment schemes such as mobile wallets. The MX 925 delivers revenue opportunities by securing payments and supporting highly profitable, next-generation services. It is an ideal platform for value-added top-up services, administering loyalty programs, and gift card issuance. The MX 925 7″ color screen efficiently accommodates signature capture, along with scrolling account activity, branding and promotional offers.